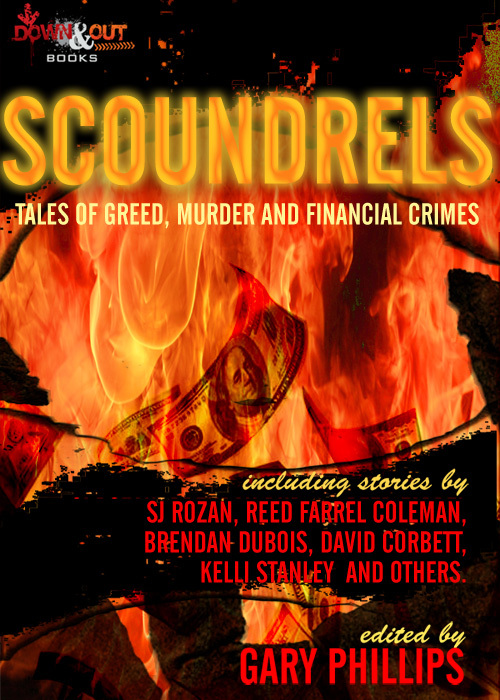 On March 20, 2012 Down & Out Books will release Scoundrels: Tales of Greed, Murder and Financial Crimes. It’s an all-original anthology edited by Chester Himes award winner Gary Phillips. The anthology includes fourteen new tales from SJ Rozan, David Corbett, Reed Farrel Coleman, Brendan DuBois, Kelli Stanley, Tyler Dilts, Travis Richardson, Eric Stone, Bob Truluck, Pamela Samuels Young, Darrell James, Lono Waiwaiole, Seth Harwood and Gary Phillips. In this arresting anthology you’ll read stories of gabbing grifters, brokers hedging big bets for the big take, schemers working the long con for the sure money, used car salesman with golden dreams and dashed hopes, bent lawyers and their more bent clients, one percenters hustling for that last half-percent, kind-hearted killers and the lonely hearted who tell themselves any lie as they double down for the long count. Scoundrels: Tales of Greed, Murder and Financial Crime will be available across all eBook platforms including Kindle and Nook as well as a trade paperback edition. Keep checking back…you may find a free story or video.